These are this year’s Halloween Treats. They were easy, different and I think really fun. 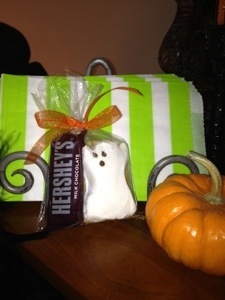 The first one is a S’more Treat- Plastic bag filled with one graham cracker, mini chocolate bar and a ghost peep. Instant S’mores. Love It ! 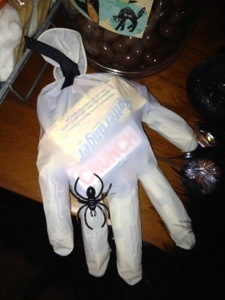 The second treat is a Scary Hand- Plastic Dr. Glove ( you can buy boxes of them anywhere these days Wal-mart etc) filled the fingers with Mini Whopper treats or you could use Smartee’s. 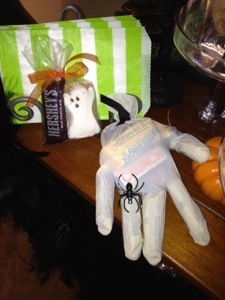 Stuffed the rest with fun size candy, tied with a ribbon and put the spider ring on its ring finger. I love these even more. Hope your Halloween is filled with goodies, goblins and more.